If you’re hosting family and friends for Easter this year, here is a simple recipe for a delicious grilled ham that won’t keep you tied to the grill all day. It’s very low-maintenance, which is exactly what I want when I have a house full of guests. I want to spend that time enjoying the company of loved ones, not tending to a complex, hands-on recipe. I want to set it and forget it until it’s time to eat! Buying a partially cooked ham makes this even easier because all you have to do is heat it to the proper temperature and baste it with the delicious sweet and savory glaze. 1. Allow the ham to stand at room temperature for 30 minutes before grilling. 2. Prepare the grill for indirect cooking over medium heat (350º to 450ºF). 3. Wrap the ham loosely in foil. Grill over indirect medium heat, with the lid closed, for 1 hour. 4. Meanwhile, in a bowl, stir together the jam, vinegar, mustard, garlic and salt. 5. 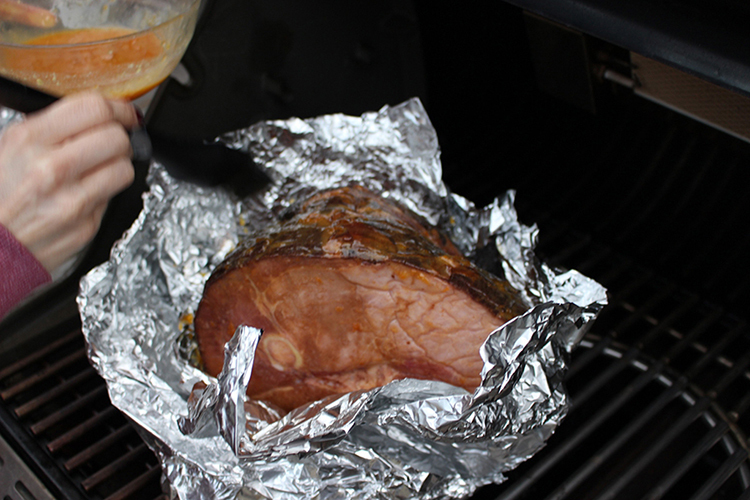 Carefully unwrap the foil from the ham and brush the glaze over the entire surface of the ham. Close the foil back up and continue to grill until the internal temperate reaches 160ºF, 2 to 2 ½ hours more. Baste with the glaze two or three more times during the last two hours, always being sure to close the foil when you’re done. 6. Transfer the ham to a cutting board. Let rest for about 15 minutes. Slice and serve warm or at room temperature.